Create some holiday magic! 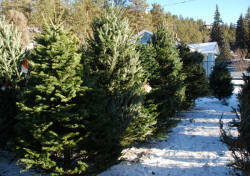 We have lots of beautiful fresh-cut Christmas Trees at the JP Total Christmas Tree Lot! Trees from 1.5 feet up to 14 feet in stock! Pre-order Extra Tall Trees up to 20 or more! Balsam Fir: Farm raised Christmas Trees from Wisconsin & Northern California. Very fragrant. Good needle retention. A traditional Christmas Tree. Canaan Fir: Farm raised in Michigan & Oregon. A mix of Balsam and Fraser firs. Has the “Christmas smell” of the balsam & the needle retention and silver “glint” of the Fraser Fir. Douglas Fir: Farm raised in Michigan & Oregon. Soft needled and tradition shape. A very popular Christmas tree. Fraser Fir: Farm raised in North Carolina & Wisconsin. Absolutely gorgeous !!! Beautiful shape and Beautiful color with tremendous needle retention. We are known to have THE MOST BEAUTIFUL FRASER FIR CHRISTMAS TREES ANYWHERE !! Noble Fir: Farm raised in Oregon & Northern California. Known across the entire country as “ The most beautiful, traditional Christmas Tree” Great needle retention, Absolutely beautiful shape. Our selection of Noble Firs are legendary !!!! Concolor Fir: Farm raised in Michigan and Oregon. Tremendous needle retention. Soft needled—a beautiful light green color. 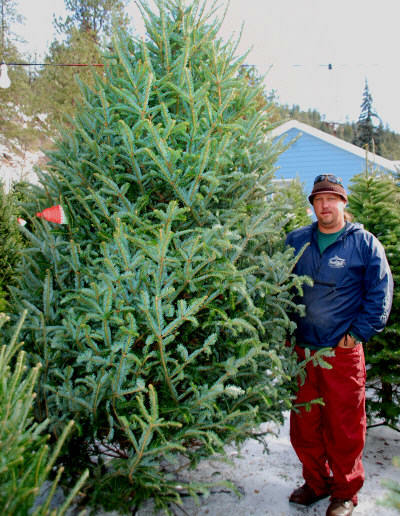 Nordman Fir: Farm raised in Oregon & Wisconsin. Very deep green. Good needle retention. The needles have a “shine” to them. Grand Fir: Farm raised in Oregon. The Christmas Tree on the postcard. Thick, dense with the perfect shape. Has a strong Christmas Tree scent & very good needle retention. Natural Douglas Firs: Harvested in Colorado, New Mexico, Wisconsin & Canada. This is your “natural” looking tree—like you would cut down in the forest. Very open with beautiful odd shapes. Tremendous needle retention. Note: We always make sure that these trees are harvested from farms and plantations and not rogue cut in a natural forest. Sorry, Christmas tree cutting is not available at our Tree Lot. 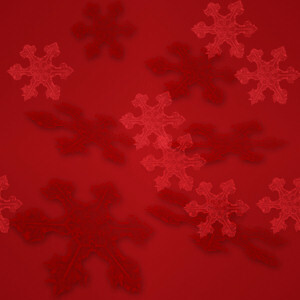 But we hope you will enjoy our pre-cut Christmas Trees in all their assorted sizes and shapes! 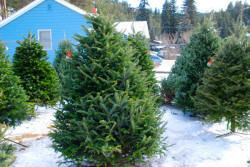 Table Top Christmas Trees - Choose from Noble Fir, Fraser Fir and Nordman Firs from 1-1/2 feet tall up to 4 feet tall. 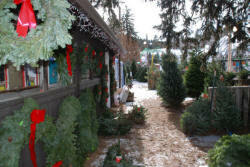 Traditional Trees - Our traditional trees go up to 13 or 14 feet. Extra TALL Christmas Trees - Pre-order an extra large tree to grace your home or office. We can order your extra large tree and have it within a few business days. We carry every size and shape that you can imagine, from perfectly shaped trees to natural looking trees like you might find in your local forest. We have a large selection of heavy-duty tree stands that will fit everything from a tabletop tree to a 25-foot tree. Our first line of stands are made of super heavy-duty non-breakable plastic. Very easy to use, easy to set up and easy to fill with water. These stands will handle anything from a tabletop tree to a 16 or 18-foot tree and are guaranteed for 10 YEARS !! Please remember--- We are not a big box store or huge chain. These so-called "bargain" stores sell their trees for low prices, but they are no bargain! Their prices are often half of our purchase price! Why? Because they buy them months in advance, and store them for weeks and weeks. Just run your hand along their branches feel the needles fall off. These trees often do not even make it to Christmas day AND they are a fire hazard! We work very, very hard all year long to get you super fresh trees, wreaths and garland. We have created long term relationships with our farmers to bring you the most fresh, fragrant and beautiful Christmas trees possible. Like our annual Pumpkin Patch, this is a family tradition—an experience that you will remember and treasure each season. We guarantee it! So… come in and visit John (JP), Cathy & the gang and pick up your beautiful, fresh tree and trimmings. Christmas Tree DELIVERY -- SET-UP -- AND REMOVAL! We ALWAYS recycle your trees at an organic dumpsite where it is composted! Receive a free half-gallon of Colorado apple cider with your Christmas tree purchase as a token of our thanks and appreciation. In this age of environmental awareness it’s appropriate to know that the most favorite family holiday tradition of choosing a real Christmas Tree over a fake tree is the most environmentally sound choice. A great benefit to our atmosphere, real Christmas Trees absorb carbon dioxide and other gases, emitting fresh oxygen. This helps the earth warming greenhouse effect. 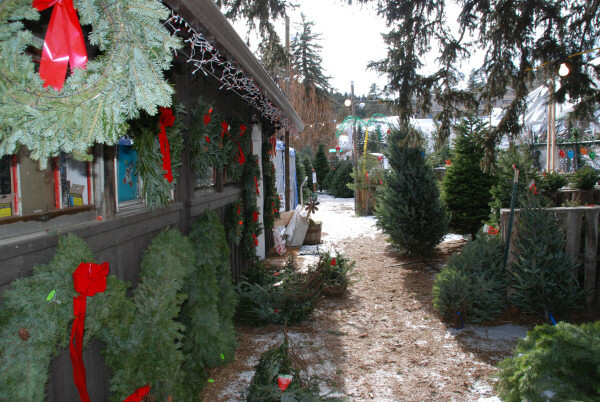 One acre of Christmas Trees produces the daily oxygen requirements for 18 people. With approximately one million acres producing Christmas Trees in The United States, that translates into oxygen for 18 million people every day. For every Christmas Tree sold 3-4 seedlings are planted in its place. Christmas Trees Farms stabilize soil, protect water supplies and provide refuge for wildlife. A Christmas Tree will be spayed with fewer pesticides during its life span than a head of lettuce in one growing season. Fake trees, which now are all manufactured in Korea, Taiwan or Hong Kong, consist of harmful plastics that are not regulated and metals. Both of which are not biodegradable. It is estimated that over 30 million fake trees end up in landfills--- forever EVERY YEAR !!. The effect of this on our environment is dreadful and will have an effect for countless generations. It’s all good. Take a nice winter day or evening and visit your local tree lot. Pick out a beautiful REAL TREE--- get your trimmings, create memories and traditions that last for generations and know that you are supporting the GREENEST CROP in the USA. You even get an after Christmas bonus. If you recycle your tree properly it will turn into compost for someone’s beautiful garden. Thus completing the perfect cycle. What better way for you and your family to participate and learn how delicate our environment is and how the simple act of purchasing a real tree can make such a difference.